You look beautiful! And the dress is so nice, I love the colours and the way you have styled it too :) take care! Oh my I totally fell in love with your brooch, its so unique! Ohh so pretty, and I love the cut of it! And $10, that's amazing. 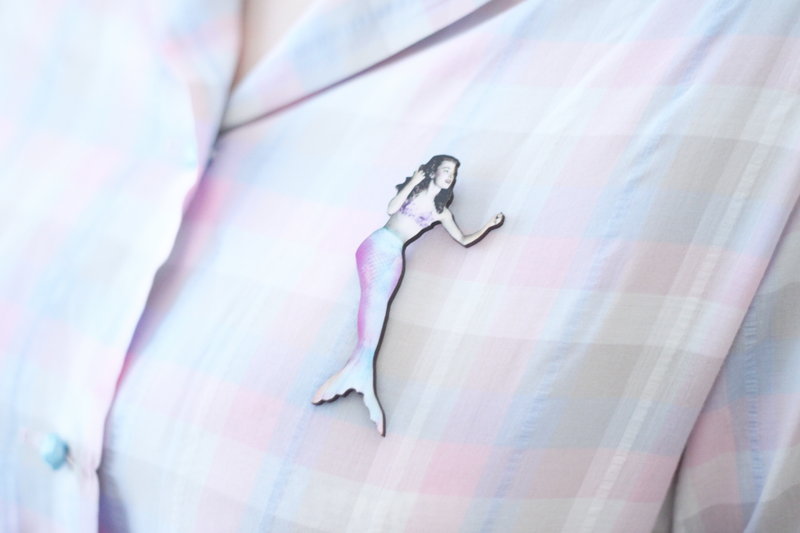 I love that your mermaid brooch matches it so perfectly. OMG. That DRESS!!! And I love the mermaid brooch! You look gorgeous. I love your style so much, Jess! 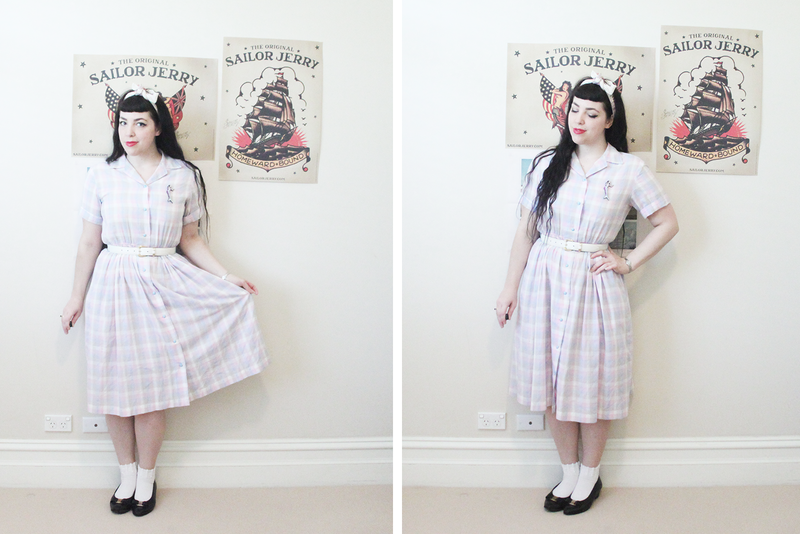 Such a cute dress and I love, love, LOVE pastels! The scarf in your hair is super cute as is your mermaid broach! It actually looks a little like you! oh your dress is lovely! Really love your brooch as well! oh my! love your dress! The dress is smashing! But the brooch!! I love that you made that, it is perfect with your dress! Aww you always have the cutest outfits :) That dress is gorgeous! There is such a sweet, gentle loveliness to this outfit and palette. It makes me think of everything from Easter decor to bags of sugary sweets, watercolour paintings to knitted baby blankets, and is so flatteringly, wonderfully pretty. I love the juxtaposition of your dark, completely mermaid worthy locks against a sea of pale hues like this. Marvelous styling, dear gal! I am totally loving this dress on you! Pastels look amazing against your hair/skin tone! This dress is totally swoon worthy! In love. Also girl, you wear your hair up so much that I had no idea there was so much of it! Beautiful. Oh this outfit is perfection! Great the dress, you are certainly made for each other :) The mermaid brooch is amazing, I just have fallen in love. you look fantastic and suit this look so so much! I have really really enjoyed reading your blog this afternoon! It is so beautiful and I will definitely be back for some inspiration!! what a lovely post, you look just darling. i am such a fan of your blog. (just wanted to let you know that i have added you to my blogroll, now that i am trying to get back into the blogging grove). where did you get your sailor jerry posters? Nice photos and dress! I love pastels. 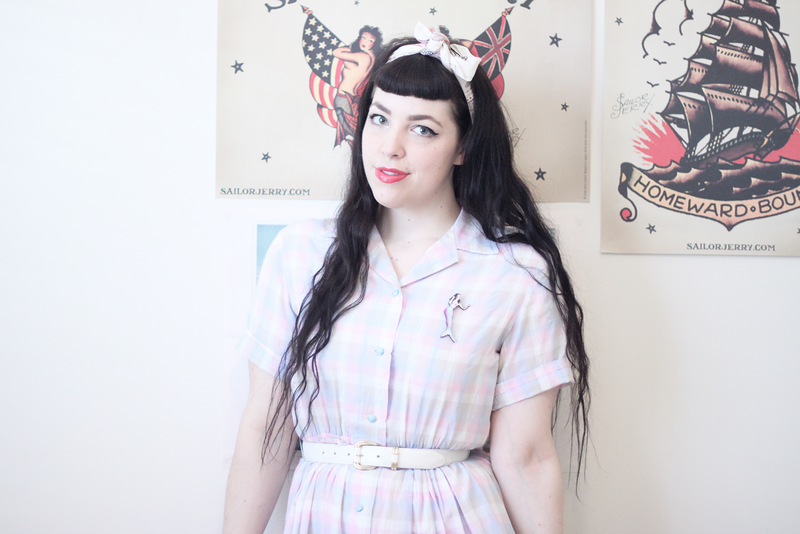 You've made the cutest badge that matches your pretty pastel dress! what a sweet dress. it looks perfect on you!